Spanish giants Barcelona enjoyed a strong start to the league campaign, winning their first two fixtures and they now hope to extend the winning run against local rivals Espanyol at Camp Nou. Los Periquitos so far have only one point to their name and they will be dreading the prospect of facing their more illustrious opponents. 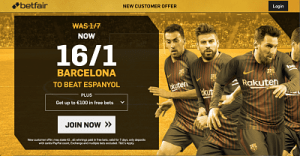 With that in mind, you should now that Betfair has enhanced the price on Barcelona to 16/1. In order to qualify, make sure to sign up via this link, entering promo code ZFBDEF. Then place a bet (max £1) on home win at the special price and you will be paid in free bets in case your wager wins.